The Wort Homestead was built by Charles Wort sometime between 1897 and 1902. It was the childhood home of Charles' two sons, John and Jesse Wort, who founded the Wort Hotel. In the 1930s our great-grandfather, Robert Bruce Porter, bought the Wort and Leek Homesteads forming what is now known as the Jackson Hole Hereford Ranch. 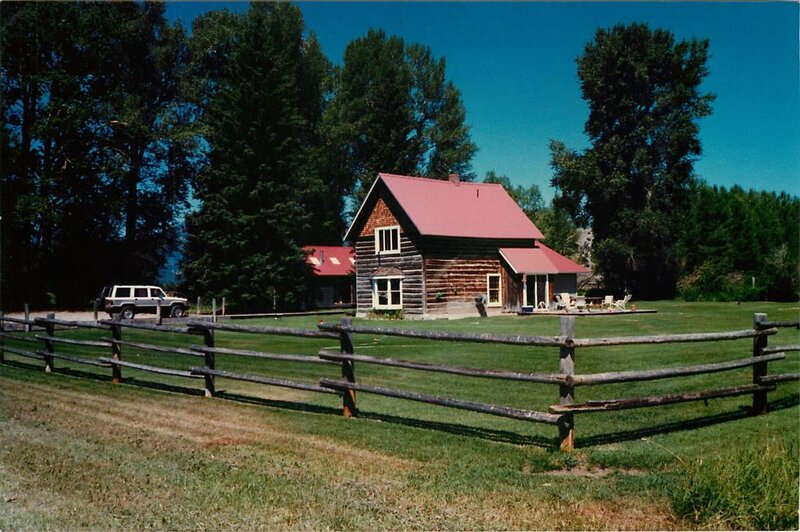 During the early years at the Jackson Hole Hereford Ranch, the Wort house served as employee housing, but eventually it became too rundown and uninhabitable. Between 1950 and 1979 the house became the party spot for local teens where many enjoyed their first drink, smoke, and kiss. When not being used by rebellious teens, cattle used it as a shelter from storms, roaming freely in and out of the structure. Original Wort Homestead Deed signed by President Theodore Roosevelt on April 8, 1902. Then, in December of 1979, at the ripe age of 21, Bruce Porter's grandson, Robert Gill (our dad) began working on preserving the Wort Homestead. At that time there was no High School Road and no Cottonwood Park surrounding the home (see above photos). Before Robert started work on the home it was completely bare inside with no windows, no foundation, and newspaper lining the walls for insulation. Robert did his best to maintain the original integrity of the home making parts of the restoration process incredibly tedious. One such project was the replication of the original shingles which required Robert to hand cut the shingles above the bay window on the South side to match the originals shingles (see photo below). He also had to install all the electrical and plumbing himself since the home had never had either of those "amenities." After two years of spending all his free time working on the house the restoration of the Homestead was finally complete. Robert lived the single life in the Wort "Bachelor Pad" from 1981 until 1987 when he married our mom, Patti. Robert and Patti had their three oldest children (including the Rancher's Daughters) while living in the Wort home. However as their family outgrew the home - there are 5 of us Gill kids now - they decided to build elsewhere on the Ranch. From 1995 to present day the Wort Homestead has been rented out to a number of Jackson families. The Wort Homestead is one of those places where you can feel the history emanating from its wall. For over 100 years, this incredible home has provided a hand-up to families, including ours, working hard to make Jackson their home. We feel very lucky to have spent part of our lives at the Wort Homestead and we hope you enjoyed hearing about it's history!